This short poetic story is by Jules Supervielle, a French poet who spent much of his life in Montevideo,Uruguay. How had that floating street been created? What sailors, with the aid of what architects, had built it in mid-Atlantic, on the surface of the sea, over a gulf thousands of fathoms deep? That long street with its red brick houses, so faded that they were turning French gray, those roofs of slate and tile, those unchanging, humble shops? And that richly perforated belfry? And this place which had nothing but sea water in it, though no doubt it wanted to be a garden, with enclosing walls set with broken bottle glass, over which a fish would sometimes leap? How did it remain standing without even being tossed by the waves? And that solitary twelve-year-old child who walked in her sabots with a firm step down the liquid street as though she were walking on dry land? How did it come about? We shall relate all these things as we get to know and understand them. And if anything remains obscure it will not be our fault. Whenever a ship approached, even before it could be seen on the horizon, a great drowsiness took possession of the child, and the village disappeared completely beneath the waves. And thus it was that no sailor had even seen the village, even at the end of a telescope, or even suspected its existence. The child thought she was the only little girl in the world. Did she even know she was a little girl? She was not very pretty, because of her rather wide-spaced teeth, and her rather too tip-tilted nose, but she had a very white skin with a few speckles—I mean freckles. And her small person, dominated by gray eyes that were shy but very luminous, sent through your body, right into your soul, a great surprise which hailed from the night of time. Sometimes in the street, the only one in that little town, the child would look to right and left as if she were expecting a friendly sign from someone, a slight wave of the hand or a nod of the head. This was merely an impression she gave without knowing it, since no person or thing could come to that lost village that was always ready to vanish. How did she live? By fishing? We don’t think so. She found food in the kitchen cupboard and larder, and even meat every two or three days. There were also potatoes for her and a few other vegetables, and eggs from time to time. Provisions appeared spontaneously in the cupboards. And when the child took jam from a pot, it remained as intact as before, as if things had been thus one day and had to stay the same forever. In the mornings, half a pound of fresh bread, wrapped in paper, was waiting for the child on the marble counter of the bakery, behind which she had never seen anyone, not even a hand or a finger pushing the bread towards her. She was always up early, and she would push up the metal screens of the shops (one labeled “Bar,” and others “Blacksmith,” “Modern Bakery,” or “Haberdasher”), open the shutters of all the houses, carefully fastening them back because of the sea wind, and, according to the weather, leaving the windows closed or not. She would light a fire in a few kitchens so that smoke should rise from three or four roofs. An hour before sunset she began, very simply, to close the shutters and to lower the corrugated metal screens. The child accomplished these tasks, moved by some instinct, some daily inspiration which drove her to look after everything. In the summer months, she would hang a rug over a window sill, or some linen to dry, as though the village must at all costs look inhabited and as lifelike as possible. And the whole year round she had to take care of the town-hall flag, which was so exposed. At night she used candles, or sewed by the light of a lamp. There was electricity, too, in several houses in the town, and the child turned the switches easily and gracefully. On one occasion she put a black crepe bow on the knocker of a door. She thought it looked nice. It remained there for two days, after which she hid it. Another time she started beating a drum, the village drum, as though she were going to announce some news. And she had a violent longing to shout something that might have been heard from one end of the sea to the other; but her throat contracted and no sound came out. She made such a stern effort that her face and neck became almost black with it, like those of drowned people. Then she had to put the drum back in its usual place, in the left-hand corner at the far end of the big hall of the town hall. The child reached the belfry by a spiral staircase whose steps were worn by thousands of unseen feet. The belfry which, the child thought, must certainly have five hundred steps (it had ninety-two) showed as much sky as it could between its yellow bricks. And she had to satisfy the weight-driven clock by winding it up with the crank handle, so that it should sound the hours exactly, day and night. The crypt, the altars, the stone saints giving silent orders, all those faintly whispering chairs which waited, in straight rows, for people of all ages, those altars whose gold had aged and hoped to age still more—all that attracted and repelled the child, who never entered that tall house, contenting herself, when she had nothing else to do, with sometimes half opening the padded door and darting a rapid glance at the interior, holding her breath as she did so. 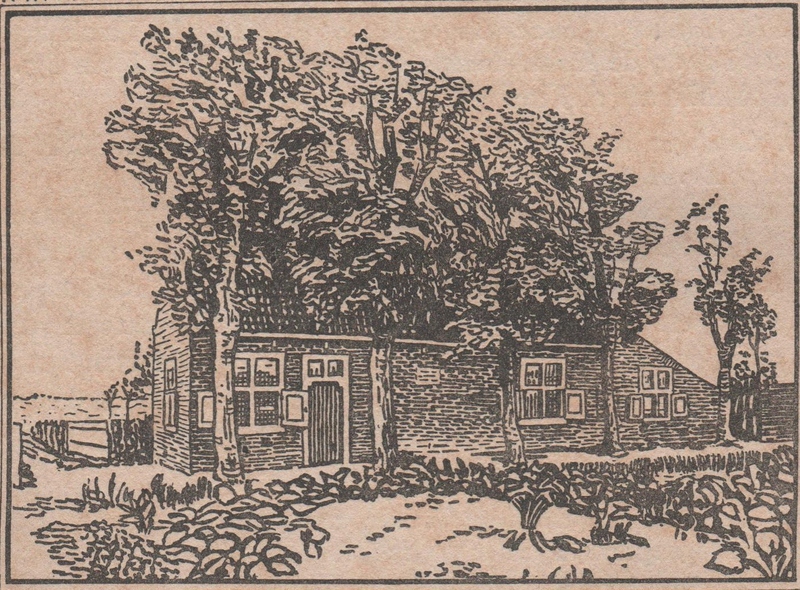 In a trunk in her room there were family papers and some postcards from Dakar, Rio de Janeiro, and Hong Kong signed Charles or C. Lievens, and addressed to Steenvoorde (Nord). The child of the open sea had no idea what those far countries and this Charles and this Steenvoorde were. She also kept an album of photographs in a cupboard. One of them showed a child who looked very like the little girl of the Ocean, who would often gaze at it humbly; it was always this picture which seemed to her to be right, to ring true; she was holding a hoop in her hand. The child had looked for one like it in all the houses of the village. And one day she thought she had found one; it was the iron hoop of a barrel; but hardly had she begun to run down the marine street with it than the hoop bowled out to sea. In another photograph the little girl was seen between a man dressed in sailor’s clothes and a bony woman in her Sunday best. The child of the open sea, who had never seen either man or woman, wondered for a long time what those people wanted, even thinking about it in the dead of night, when lucidity sometimes strikes you suddenly with the violence of a thunderbolt. Every morning she went to the village school, with a big satchel containing notebooks, a grammar, an arithmetic, a history of France, and a geography. She also had, written by Gaston Bonnier, member of the Institut and professor at the Sorbonne, and Georges de Layens, laureat of the Académie des Sciences, a little field guide which listed the most common plants, as well as useful and harmful plants, with eight hundred and ninety-six illustrations. And how were history, geography, countries, great men, mountains, rivers, and frontiers to be explained to someone who has nothing but the empty street of a little town in the most solitary part of the Ocean? She did not even know that she was on the Ocean, the very one she saw on the maps, although the idea did cross her mind one day, for a second. But she had driven it away as mad and dangerous. Let’s share this, shall we? away along the dusty road. clouds and the flying fish. I thought I heard a noise, but it was the noise of the sea. Or else she wrote a letter in which she gave news of her little town and herself. It wasn’t addressed to anyone and she put no kisses for anyone at the end of it, and on the envelope there was no name. And when the letter was finished she threw it into the sea, not to get rid of it but because it had to be that way, and perhaps in the manner of navigators in distress, who consign their last message to the waves in a despairing bottle. Time never passed in the floating town: the child was always twelve. And it was in vain that she swelled out her little chest before the glass-fronted cupboard of her room. One day, tired of looking, with her plaits and her very bare forehead, like the photo she kept in her album, she got cross with herself and her picture and scattered her locks roughly over her shoulders, hoping that this would give her age a jolt. Perhaps it would even affect the sea all round her, and she would see coming out of it great goats, with foaming beards, who would draw near to look at her. But the Ocean remained empty and she received no other visits than those of the shooting stars. Another day destiny seemed to forget itself for a moment, as though there were a sudden crack in its will. A real little cargo boat, all smoking, as obstinate as a bulldog and riding easily although it was not heavily loaded (a beautiful red band gleamed in the sun under the water line) —a cargo boat passed down the marine street of the village, without the houses disappearing beneath the waves nor the little girl’s getting overcome with sleep. And she flung her schoolgirl’s pinafore in the direction of the ship. The helmsman did not even turn his head. And a sailor, who was puffing smoke from his mouth, passed along the deck as if nothing had happened. The others went on washing their clothes, while on each side of the ship’s bow dolphins separated to make room for the cargo boat, which was in a hurry. The little girl descended very quickly into the street, lay down on the track of the ship, and embraced its wake for such a long time that, when she got up, nothing remained of it but a stretch of sea with no memory, quite intact. On returning to the house, the child was dumbfounded at having shouted: “Help!” Only then did she understand the profound meaning of this word. And this meaning terrified her. Could men not hear her voice? Or were those sailors deaf and blind? Or more cruel than the depths of the sea? Then a wave, which had always remained at some distance from the village, clearly not wishing to intrude, came to look for her. It was a huge wave, which spread much further than the others on each side of itself. In its crest it had what looked exactly like two eyes, made of foam. You would have supposed it understood certain things and did not approve of them all. Although it furled and unfurled itself hundreds of times a day, it never forgot to equip itself with those two well-formed eyes, in the same place. Sometimes, when something interested it, you would catch it lingering for nearly a minute, with its crest in the air, forgetting its wave nature and that it had to begin again every seven seconds. For a long time this wave had been wanting to do something for the child, but it did not know what. It saw the cargo boat disappearing and understood the anguish of the little girl who remained behind. Not being able to bear it any longer, it carried her a little distance away, without saying a word, as though leading her by the hand. After having knelt before her, wave-fashion, and with the greatest respect, it tucked her under itself and kept her for a very long moment, trying to confiscate her with the collaboration of death. And the little girl stopped breathing to help the wave in this serious plan. Failing to achieve its object, it flung her into the air until the child was no bigger than a sea swallow, catching her again and again like a ball as she fell back among the foam flakes bit as ostrich eggs. Finally, seeing that nothing was of any avail, that it could not succeed in giving her death, the wave took the child back to her home, with an immense murmur of tears and excuses. And the little girl, who had not received a scratch, had to begin opening and closing shutters again without hope, and disappearing momentarily under the sea the moment the mast of a ship showed on the horizon. Sailors who dream upon the high seas, with your elbows propped on the handrail, be fearful lest you dwell too long in the darkness of the night on a beloved face. For if you do, you risk giving birth, in places that are essentially deserted, to a being gifted with ever human sensibility, who can neither live nor die nor love, and yet suffers as though he lived and loved and was always on the point of death, a being infinitely disinherited in the watery solitudes, like that child of the Ocean, born one day in the mind of Charles Lievens, of Steenvoorde, deck hand of the four-master Fearless, who had lost his twelve-year-old daughter during one of his voyages, and one night, at a place 55 degrees latitude North and 35 degrees longitude West, thought of her for a long time, with terrible intensity, to the great misfortune of that child. Le Theatre de Nuit has made this interpretive short film based on this story. Theatre de la Nuit website with this story. What becomes of those creatures who find our way into our homes so far removed from the wilds? How do we reckon with our desire to know and understand them? And how do we imagine what they long for if they’ve never known the wilderness from which they came? The German Romantics explained longing as though it were bumping up against a membrane separating one from the final sensation of the sublime in nature. The deep glow of a sunset could penetrate our eyes only so far, the hushed calm of the forest could infiltrate our skin only so long, and the brief moment when a deer entering the meadow paused before realizing it was seen, this split-second awareness still let us know where we stood: across the green field, in the domain of humanity, bumping into the awkward upright posture of our selves. Filled with a kind of longing for an intimacy with something we can never truly know. We’re most often like uninvited guests in the wilds of nature, and perhaps a bit anxious when the creatures we encounter fail to welcome us in. It could be why we began the dubious practice of coaxing them to eat from our hand, as though our offering allows us to part the gauze curtain for a moment and put our feet up on the sofa of the wild. It is easy to feel honored by the brush of anxious whiskers on our skin, the touch of a tongue tasting us in a way we find acceptable: without teeth. To stroke a trembling animal unaccustomed to human touch brings one close to their trepidation, their racing hearts, a rightful suspicion that cannot be petted away. It is perhaps that mysterious wildness which increases our respect for them, for their way of life; and in trying to understand their longings it makes us deeply question our own. When Mr. Fish arrived in our home he was a small brown thing with black spots left in a glass bowl by a friend departing for the East Coast. With a fine large translucent tail he swished back and forth with a gentle eagerness for food dropped from some mysterious source above. With tiny arm-like fins he navigated elegant quick turns from within the confines of his small transparent pond. He established himself in the center of our lives on the kitchen counter, wagging near the glass as we chopped up vegetables, darting back and forth when we reached for a spice from the cabinet, and pursing his lips at the surface of the water then opening them in bubbly smacks which suggested his unlimited appetite. In most goldfish legends, their appetite is always spoke of as grand, but their memory or intelligence is held in slight account. It is assumed that in each lap circling the bowl they fail to recall that everything is quite familiar and welcome it instead as something new. For centuries it has justified giving them a decorative glass-bound existence where they are seen as a hobby and not as a pet. And it has perhaps made them susceptible to fraternity boys trying to swallow them, or explains why they are carried away in plastic bags as prizes from school carnivals. If anything goes wrong in caring for goldfish, they are easily flushed away. For these reasons their lives are not often long, and in their cramped quarters, they are not very large. But Mr. Fish began to grow, and grow. His tiny arm-fins whirled in circles lifting him to mouth the surface. When you bent down he paused at the side of the bowl his eyes goggling and his body small from the curve of the glass, he now wore a question across his forehead. When he swam it seemed more like the frustrated way one might circle a parking structure always looking for an open spot. Then, after we went away leaving him in the care of a dear friend, he began to make demands. He had reached the size where a swish of his tail could lob a vocal splash a good distance from the bowl. We tried to offer him a new home in the closest thing to a pond: an aquarium. Envisioning a ‘room’ in nature, we took it out of nature—a cake-like slice of layered water and plants and pond bottom, bringing it home to him in a box. Mr. Fish could now swim up and down, side to side, exploring all the corners of a square new world. He raced through the water enjoying his first real swim; it was exhilarating to see him streaking all around quite fearlessly Then he could pick through the bits of rock on his new floor and spit them endlessly back each day looking for food. At last he had something more to do. But the times when I got up to look at him in the dark he was searching the gravel with a kind of betrayed frustration. It appeared as though he’d lost something, possibly a notion of a real pond somewhere like a shiny watch chain which had slid down between the rocks. Perhaps that is all part of our strange human perspective where we press our face into water and see a blurry moving world which challenges our own. We often imagine things, attribute things. In the extracted glass simulated nature in which most humans keep fish, they usually offer them buxom mermaids combing their hair, overflowing treasure chests of jewels and coins, tippling jolly rogers or gigantic skulls where the fish can dart in and out through the eye sockets. What is their pleasure in the sunken galleons of every size, the pagodas, castles, curved bridges which begin and end nowhere? A fish might want such a sign near a real pond, warning humans not to become predators like all the rest. Yet who knows what memory Mr. Fish has of a faraway place in the wilds of nature he has never known? At the back of that furrowed brow is there an embedded virtual pool? Is it surrounded by uneven stones where fish wriggle between the stalks of plants, dodge other creatures of the shallows, glide noiselessly for long distances with fearless grace? A place where the day is spent not idly waiting for food but engaged in the act of finding it. A pond which chills in the winter and everything slows to near stillness. A place where, when the water warms in spring, the fishes hover together in the pale band closest to the sun until the heat reminds them to seek and find one another at last. I do not know whether I ever said then that I loved Mr. Fish. He grew and grew. His dream pond, the rumor of his legitimate life somewhere in the wilds, was beginning to bump up against my heart whenever he wiggled the short length of his tank. He always hit the glass with widening eyes, then his mouth opened, his lips outstretched as if trying to drink in all that was beyond. I know about that beyond. There are ponds where the sweetness of the water embraces you, the leaves of plants brush against you, where the chill numbs your skin but awakens your soul in the heart of the forest. Mr. Fish burgeoned to several inches long until it was difficult for him to negotiate a turn. He back-paddled with an arm-fin screeching one side to a halt while the other fin gestured wildly, like a traffic cop motioning us to ‘move along!’ So we got a new tank twice the size of his first one and cleared a spot for him in the dining room. There he swam further and seemed happier. His character and his size continued to grow. He would sometimes pause in mid-stroke as if he had a change of mind, and in his portly large size, when he would occasionally stretch his mouth in a masterful yawn, he resembled a fine older statesman. He would slowly approach the glass then look directly at you as though something was mutually understood. And because he as no longer in the center of all the action of our lives, when we entered he would abandon his decorum. He would rush to the light and begin an attention-getting dance, a shimmy with eager eyes while his lips seemed to be mouthing some words. Fish are cold-blooded and for some this accounts for their incomprehensible nature, their lack of personality. They have no eyebrows, for instance, and no voice. They cannot command us with a bark or meow, seduce us with a whine, or alert us to their pain with a cry. We cannot touch them. But they can show us their colors as Mr. Fish did, gradually turning a brilliant orange beneath his black spots. And they can see into us with their eyes. We went away again and when we returned Mr. Fish was very ill. Hiding in the corner he refused to eat and his forehead was scarlet. Experts were consulted all over the map, each with a different prescription and advice. After giving him the medicines I watched helplessly from behind the glass of his ‘hospital tank’ as he huddled bleary-eyed in the cloudy water. I tried to tempt him with food held in chopsticks near his mouth. White sores appeared on his forehead; a red streak ran like a river through his tail. To make sure his main tank water became pure again, I became an alchemist, filling vials with drops of solution then holding them up to the light. Color took on harsh significance. I became terrified when the vials appeared to test red, or brilliant green, or dark cobalt blue. I lugged countless gallons of fine mountain spring water up the many stairs to his artificial pond, offerings of purity from that distant enigmatic source. For weeks each day was different: one day life, the other day death; one day hope, the other despair. And in looking at him so intently day after day for a sign of improvement I realized how seldom I’d watched him before, how little I had known him in the past. It was a this moment I knew how much I had grown to love Mr. Fish through the ache in my arms on the other side of the glass. I could only watch, longing to hold him and reassure him and take away his pain. Is this moment of awareness we all have of loving, the profound anguish when our love is out of reach and in danger of being taken away? When you are at your most powerless, your least reasonable self? In terrifying dreams Mr. Fish became taller than I and I staggered about holding him in my arms, carrying him upright and dripping. In this nocturnal myth I wandered trying to find a soothing pool for him that, each time I woke, was further from sight. Finally, on a day in late spring he seemed a bit better. Though his eyes were still foggy and uncertain, he no longer hid in the darkest corner. He had become near-sighted and bumped into things so I offered him his food as though I were at an official function serving hors d’oeuvres. He reached for each morsel with the uneasy nonchalance of someone attending a reception, but his telltale outstretched lips again betrayed his enormous appetite. Surprisingly, somehow through all his illness he had continued to grow. His size again became an obstacle. In order to turn he had to dip his head down then flip himself from side to side like a lap swimmer. He was now a huge fish, a foot or more long, a fish with a certain gait like an old professor who had lost his glasses. When you sought his attention, he turned slowly as though his arms were full of books and his mind on something else. A new pond perhaps? We brought him a new tank, this time nearly filling a whole wall of the house, the largest block of water we could find. And still missing a few scales and with a reddened forehead, I lowered him into his new home in a clear sack. Like a child frightened by the enormity of his first day at school, he rushed back into the corner of the bag and refused to come out, then gradually he turned and swam out into the expanse of his new home. He looked a bit curious he took a mouthful of gravel and swiftly blew it out, and then he began to swim. Slowly at first, and then with absolute excitement he started to race the whole length with his small arm-like fins pressed back at his sides, letting his giant tail wiggle back and forth like a porpoise and ending with a graceful glide to stop well before the end of the glass. I saw things become clear to him, how the new and varied plants provided a safe place to hide when he wanted privacy. In the night when I peeked in to watch him in the dark, I saw him soaring as though in an endless sky. His small fins outstretched and his tail straight, he took off from the bottom, gliding up to the surface to check the midnight air, then let himself drift down as though safely held by a parachute to nestle on the floor and become very still. In the cool depths of his pond he appeared to blink and fall asleep. The happiness of one you love often counts for your own. In Mr. Fish’s current cubic pond he appears to be as happy as I’ve ever known. The dreams of the distant mountain ponds are farther away for me; I no longer stagger carrying him there in my dreams in the dark. It has even occurred to me that perhaps he now might long for a friend. Someone to swim with and exchange fish remarks with as they sort through the gravel during the day. Someone to chase in and out through the plants. Who knows what amount of mischief they could come up with… It seems simple to do, bring another fish home in a bag. Why not? The urgent need to be mindful of the quality of their lives is always there, humming in my heart. The weight of all that. 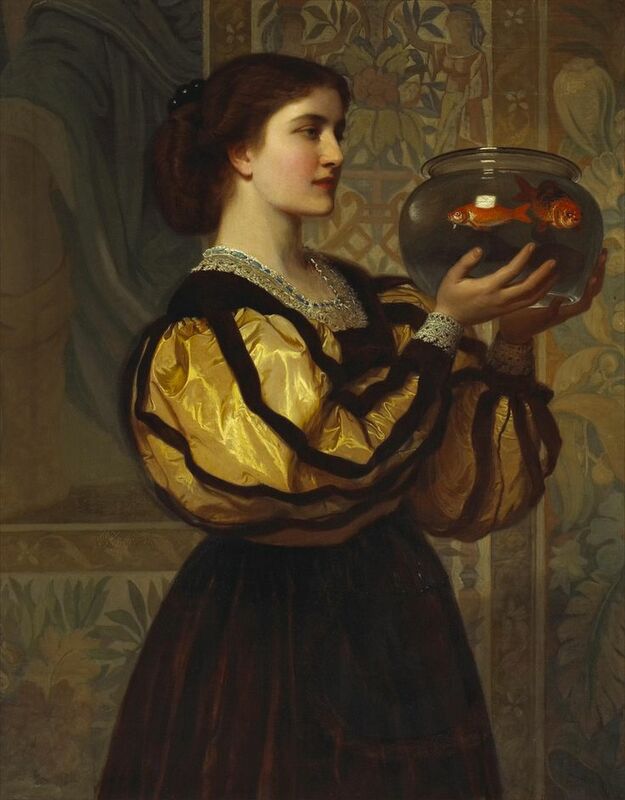 But even more I shudder and something leaps up and catches me with its wild fear: that I might grow to care for that fish too with the same regard. What it has meant to love Mr. Fish. What it means to love. What meaning expands and allows. AU REVOIR: Sadly, in late August Mr. Fish leapt from his brief stay in his smaller hospital tank after his illness returned. I returned home too late to save him, though tried desperately to revive him for half an hour, swishing his large foot long orange and black form back and forth in the water as they direct you to do in the fish first aid books. Then I was forced to look into his wide eyes and mouth frozen in a gasping cry. I could not help feeling the pain of his final suffering, reliving each moment of flapping on the floor, acknowledging the purity of his primal innocence weighing in with my ultimate responsibility for his welfare, and finally and most selfishly, just missing him so much—his eager face and eyes wagging before me, anxious for his evening meal. I hiked to a place early the morning after his death where I found him a pond at last, and left him hidden in the watery rushes at the side to join nature in his own way. This essay by D. L. Pughe originally appeared in BARK Magazine. One of the endless wonderful things we love about dogs may be their ability to pull us so completely into the present. We forget about the load of past we usually drag around behind us, and the clouds of future we forecast up ahead. What human being can match a dog in how they so gratefully embrace what the day will offer up to immediate experience? As Pascal tells us, human beings must continually make efforts to acquire this newness of spirit, “since we can only preserve our former ‘grace’ (as he calls it) with the acquisition of new grace.” Perhaps one of the many reasons we befriend a dog is for an infusion of grace that no one else can offer to the same degree. Dogs do, in fact, have their own sense of time. As with humans, scents and smells pull them backward into memory, and also like us, dogs have been known to save treats for a future moment of need. But it is still the greatest challenge is to catapult oneself into the canine mind and decipher how they regard seconds, minutes, the accumulation of hours into days. I spent a good while walking dogs at the county animal shelter in Iowa City, and one of the most congenial dogs there was an American Foxhound named Daisy who had spent most her life in confinement. She had been in one institution or another for more than two years since she was found as a 6 month old pup roaming the countryside of Johnson County, 50 miles away. Daisy looked to be a purebred Foxhound who had chased a deer or furry creature too far from a pack of like-minded hounds on a hunt with their owner. She’d been wandering in the wild long enough to develop a serious ear infection and to become pregnant. After being rescued, she was sent to the Kirkwood Veterinary College where interns successfully operated on her ears then delivered her puppies as a case study for the obstetric vets. Everyone at the Vet school took to Daisy: she was good-natured, easy-going, well-behaved, grateful for attention but never demanding. She stayed many months, long after her puppies were born and given away, and her gentle nature made her an easy ‘test animal’ for demonstrating veterinary techniques like drawing blood. Nearly a year later, Daisy transferred to the Iowa City Animal Care and Adoption Center, a highly regarded county shelter where all the animals are well treated and almost all find good homes. She arrived in the spring, when an excess of cute puppies were adopted first and her stay continued on for a long year. She willingly settled into her new 4′ x 6′ kennel and looked forward to playtimes out in the fenced yard with other dogs and to daily walks on leash by the Iowa River with the Center volunteers. At the beginning of each walk she would shake her head happily, her sensitive ears flapping wildly. And afterwards she gratefully stepped back into her cage, sat on her bed, and politely received her treat. Many dogs in shelters, especially if they’ve come from a happy family home, grow sad in confinement. Over a period of weeks you witness their soul begin to wither, they lie facing the back wall of their kennel, barely lifting their heads to see who is walking by. Their sadness is palpable and heart wrenching. Daisy showed only the smallest glimpses of this desperation, and seemed to amiably accept whatever came her way in terms of kindness. She was a pleasure to walk and I began taking her on more distant adventures along the river. On a lark I emailed her picture to a friend back in Berkeley, “I’ve found the perfect dog for you,” I told her “Not only is she beautiful and the best behaved dog I’ve met, but she just matches your china!” My friend Margaretta’s vintage porcelain features a pack of Foxhounds spiraling into the center of each plate followed by a fleet of red-coated horsemen. I was completely surprised but delighted when she answered back that she was interested, undaunted by the 2,000 miles between where Daisy and I were and where she was writing from. She had lost her older dog a few years back and had been looking for a new one for awhile. When she heard Daisy’s story, Margaretta quickly applied for adoption by Fax, and once accepted, we set about finding a kind soul who could drive Miss Daisy from Iowa to her new Berkeley home. This was the moment when Daisy came to live with us for a month. We were visiting academics who normally live in Berkeley but were staying a year in a house just 4 blocks from the Animal Center. By the time she came to us, Daisy had been well over two years in kennel life and was such a gracious and good-natured dog, stately and quiet. I thought of her often like Nelson Mandela, someone who had spent so much of life in confinement yet kept her nobility and generosity of spirit. Daisy had a sense of depth and seemingly infinite patience. Being aware of her past, I happily watched her grow less serious and more playful day by day. After a week she clearly thought she was here to stay and began romping a bit like a clumsy puppy with an overgrown adult body. She would crouch in play posture and rabbit pounce in happy circles. Being so aware of her past confinement, I wanted her to enjoy her newfound freedom and took her on long walks as often as I could. She was truly being reborn into a new wide world. But I also knew she was only staying ‘awhile,’ a notion I was at a loss to explain to her. I realized the disappointment ahead in thinking of our house as home only to be uprooted once more and taken by a long car ride to her final destination. But to attempt to enter dog perspective one must first decide what is their ‘natural culture.’ In today’s urban requirements to leash and clean up after our pets, few dogs have a life of freedom to come and go as they please from our homes. Their sense of time revolves around our own schedules: when we wake and rise to feed them, take them for walks and out to play and, sadly and ultimately, when we must decide their time is up. Their own sense of time is one poised in our duration, which they seem to endure with sometimes amazing patience. Often, because of their need for our assistance to be out in the world, I think I can safely say that most dogs are exceedingly well rested, napping diligently out of the boredom of waiting. In Daisy’s case, I was too sympathetically aware of her past, her years of confinement; it was always with me in the present, along with my knowledge of her upcoming future. I’d imagine the endless procession of nights she’d spent at the shelter, where lights are put out at 5:30 p.m. and the dogs lie in the dark until an attendant returns at 7:00 the next morning— similar to an experience watching Birdman of Alcatraz as a child where I became painfully aware of the reality of being ‘sentenced’ to ‘doing time.’ Then I shift to imagine the disruption of the upcoming long car trip to her new home. Meanwhile Daisy was happily settling into our home in the present, though still a bit tentative about what to expect. She began to test boundaries just to see how things worked, gently sticking her nose into our trash can, grabbing a glove from the table and dropping it at my feet. She responded amiably to rules against such activities, and seemed to be checking on who was in charge. I wanted her to enjoy the world as much as possible now in compensation for her years of confinement and we embarked on long walking excursions around town. People often stopped us on the street to talk to her—she’d become a minor celebrity from an appearance we made on TV and from the many vet students and volunteers who had worked with her in the institutions she’d stayed in. Memory is most tied to scent and hounds like Daisy are primarily attuned to smell; it was hard for me not to think that her past was trailing around with us in where her nose led us. More likely, it was her interest in small furry creatures that pulled us along, and the bits of food that only dogs seem to be able to spot on an empty street. But she appeared to recognize places, rushing up the steps of certain houses, plopping down once on a sofa on the porch of a student apartment as though she’d been the resident who’d caused it sag like a hammock. How long had she roamed the wilderness and fringes of the town before she’d been discovered? She wanted to get into any car, and once in the middle of an intersection yelped with recognition at a certain pickup, straining on her leash as though she’d found her long lost owner. I was certain they must have been heartbroken when this wonderful dog had disappeared, but felt like that past was gone and a better world for her lay up ahead in California. As Daisy’s present was becoming more and more stable, she was less anxious when I left her alone and had grown familiar with our own routine: when she could expect her walks which, even in 20 below zero weather and deep snow, were her supreme delight. Routine, it seemed, calmed Daisy more than anything and I saw how this had become the key to her survival in captivity. But where we use our eyes to note minute changes in the neighborhood (a neighbor’s walk has been shoveled, their lawn mowed), each time a dog goes out into the world it has been replenished with countless invisible smells. And where most dogs’ philosophy of time is that of Winnie the Pooh, who sets his clock to 11 a.m. when it is always ‘Time for A Little Something,’ Daisy thought ahead. The treats we gave her she hid away, sometimes taking as long as an hour to bury one at the bottom of the clothes hamper for use some later day. Her future, the long journey ahead with someone she didn’t know, was looming for me, with no way to explain it to her though I confess I often did discuss her California home in glowing terms. When the day came for her departure, I realized how happy she had become here, how trusting. We made a happy commotion when our friend Craig arrived and loaded her things into the trunk and she gleefully jumped in the car, but as it drove away I saw that she had enough time to look back and realize I was not coming. It was haunting to see the panicked look frozen on her face and not imagine it reflected in the car window as she rode through long nights of hushed winter prairies. I felt as though I was caught in a relativity fable, riding a light beam parallel to the car but helpless to reassure her. As human beings, when we meet people we like in the course of our travels, we enjoy warm meals together and laughing over shared stories. It is always hard to leave, but we know we have letters, email, the telephone, and a future where our paths might cross again. There was no way for me to explain the future to Daisy: that in a few months time I would be living across the street from her, able to share walks from time to time with her and her new ‘mom’. If a dog can feel betrayed, I suspected that kind of hurt was perplexing her now and for nearly 50 hours of travel by car. I knew once she arrived in California in Margaretta’s warm embrace she would be in heaven, and it was true. I was right, but she was wary to accept it at first. How can you tell a dog that this time it is ‘for keeps,’ that she would now be able to enjoy the succession of days with a true friend for the rest of her life? Months later as I was leaving Iowa to return to Berkeley I found a treat Daisy had hidden in the folds of a pile of clean towels, her pledge to the future. I carried it back to her in her new home and Margaretta led me down to Daisy’s ‘queendom,’ her own backyard. She was napping in the sun and she greeted me happily, doing the silly circle dance; Daisy was clearly now happy all the time. She ran over to her own spacious dog house and pranced in to show it off, then we noted all her new ‘projects,’ a series of gleeful excavations that are being indulgently allowed, given her long history on concrete floors. Indoors, Daisy has two beds and enjoys retiring with Margaretta to a large fluffy one at the end of long adventurous days. She loves their routine, their daily walks and routes. the curious new symphony of smells, and glimpses of the deer that live on the other side of her fenced forest. This essay was first published in BARK Magazine in Issue 32, 2005 and was one of six favorite essays chosen by the editors of BARK in its first decade of publishing. [i] In cinematic time, this narrative path is always shifted, and it does make one wonder if dogs can experience things cinematically as Godard suggested: films have a beginning, middle and end but not necessarily in that order. [ii] An example purported to be from cognitive psychology that is hard to contemplate (unless you’ve admitted the difficulties in also realizing what the words to ‘three blind mice’ actually prescribe) tells us that rats put in a bucket of water will drown after three hours of struggle. If the rats are rescued after 2-1/2 hours, before their energies were exhausted, then put in water again a day later, they can struggle along for 5 hours. Hope. Even when it may be for Godot instead of God. (This example, by the way, is most often quoted in Christian sermons and biblical text analysis and used by business gurus in management seminars and is alternately attributed to Duke University or University of California at Berkeley). There is interesting testimony to how the ‘desensitization’ (we might call it insensitivity) required of researchers who use animals in experiments such as this one is an subject in its own right. See Roger E. Ulrich, “Animal Research in Psychology: An Example of Reinforced Behavior” in the Journal of Americans For Medical Advancement: Perspectives on Meidcal Research, Vol. 3 (1991). [iii] Recently, in an earnest but entirely artificial laboratory setting, scientists conducted controlled experiments to ascertain the circadian rhythms of dogs. In an experiment on purebred beagles in Italy, the dogs were kept in 140 X 200 cm. pens in relative isolation (away from other dogs and human contact) for 8 with days with rectal thermometers which measured their temperature every two hours. Night and day were simulated by laboratory lights on and off and the dogs were fed once a day, four hours after the lights were turned on each day. Even in this highly artificial setting, the dogs exhibited heightened temperatures at certain same times each day, indicating circadian rhythms usually found in most beings in nature. What this tells us about how dogs experience time, or how they found the confinement and intrusion of instruments during this experiment is still inaccessible even to our imaginations. R. Refinetti &G. Piccione, “Daily Rhythmicity of Body Temperature in the Dog.” Journal of Veterinary Medical Science 65 (8) (2003): 935-937. [iv] Wemelsfelder, Françcoise, “The scientific validity of subjective concepts in models of animal welfare.” Applied Animal Behaviour Science 53 (1997) 75-88. [v] Timberlake, William, “An animal-centered, causal-system approach to the understanding and control of behavior.” Applied Animal Behaviour Science 53 (1997) 107-129. Timberlake proposes a revised notion of empathy, a ‘theromorphic’ approach, where the researcher attempts to see the world through the eyes of the animal by first understanding the perspective of their vision, then the expanded range of their other senses of smell, taste, etc. In what to me seems the most ‘natural’ approach using Timberlake’s theory, Elizabeth Marshall Thomas in her book The Hidden Life of Dogs attempted to infiltrate dog culture as an anthropologist. She began by observing her two dogs in an urban environment, later on a ranch in the West she studied larger group of dogs which she gave a spacious territory under their own control. The dogs Thomas observed on her ranch were able to establish a culture among themselves rather than in relationship to her. Though she continued to provide food, she did not interact with them as pets and attempted to infiltrate the ‘pack’ in the beleaguered position far down in the social hierarchy. Thomas quickly found that being first in the order of eating, the choicest morsels, and the best spot in the collectively dug out den were all awarded to the alpha dog and then in order the dogs themselves had established. Because she was still the main provider of food, daily rhythms still focused on her times of feedings, but she watched how the shifting sun and weather affected daily routines the dogs established among themselves. [vi] Though the dogs under her care had a larger area in which to range, napping in the sun did figure significantly as a pastime. Thomas, Helen Marshall. 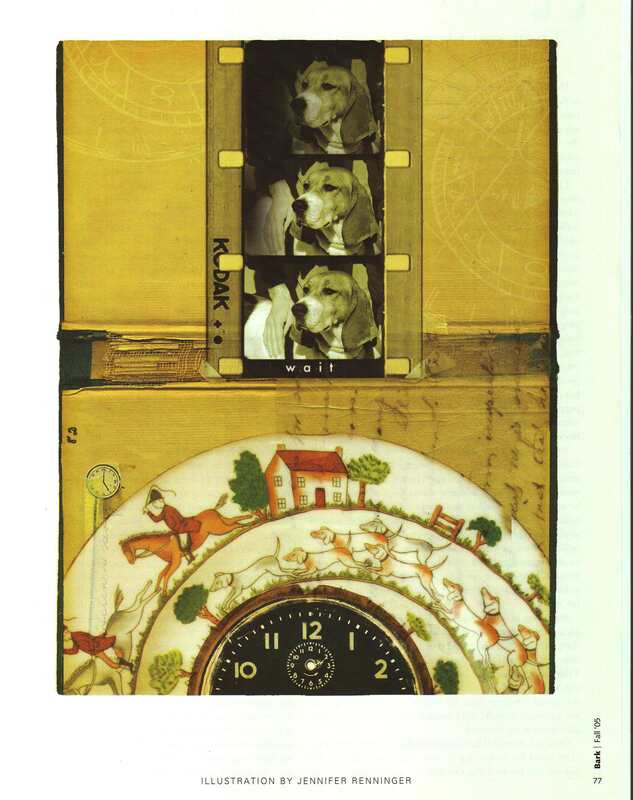 The Hidden Life of Dogs (New York: Houghton Mifflin Co, 1993). Mayer is on his side again, on a slim leather couch in the cramped but magical guest room of his old friend János, a professor at the New School in New York. A few decades ago János proudly showed him how he had taken over the large closet in his tiny apartment, built maple bookshelves all the way up to the high ceiling and inset a desk with intriguing compartments into one wall. On the wall opposite he managed too squeeze in the small sofa. Books filled the four walls and in the narrow space around the door jam he made shelves for LP’s and a niche for his stereo and a short-wave radio. Speakers rescued from broken TV’s left on New York streets stared down with round faces from each of the four upper corners. “A cathedral in a shell…” Mayer had said when János demonstrated the acoustics. “Exactly…” his host smiled then brought out his most extravagant purchase —thick, soft leather-padded headphones for working late into the night. It was here on the leather sofa straddling the wall opposite the desk that Mayer surveyed the changes over the years. He was still surrounded by books, in fact they were now stuffed into every shelf and stacked on the floor. Some shelves had been covered over with framed prints and sculptures had been pushed into niches made by smaller books. The closet had slowly grown into a cabinet of curiosities. The small couch, just the length of Mayer’s frame, is where he has always slept in New York over the years, preferring it even when his travel funds could afford a grand hotel. The niches for LP’s had been subdivided, first for a phase of cassette tapes and then re-configured for CD’s which jammed every crevice and were stacked in towers in front of the shelves. As time went by, the books in Hungarian had risen slowly to the top of the shelves, the books in English and French gradually took over the lower ones surrounding the uneven piles of papers spilling over on the desk. The stacks of books and CD’s left only a small bit of floor uncluttered making the approach to the couch a slalom over the thick Turkish carpet. And though it still looks like a fine leather sofa, the burnished sheen of years adds to how one sinks into its curves and sags. Not nearly as comfortable as it once was, like age itself it’s familiar embrace is holding its own. Each time he re-enters this chamber, Mayer is reminded of the festival of Corpus Christi. Southern Mediterranean families bring out their most valuable wealth on that holiday, stacked in front of their homes as a ‘technical’ offering to Christ. A sort of innocent ostentatiousness, Mayer feels, though his Catholic friends find the display as embarrassing as the ancient barter for indulgences. Sometimes, though, abundance can be bolstering; a sense that life on earth has its rewards that the distant whiff of Heaven cannot know. And in János’ book-laden closet, Mayer always finds the overwhelming rush and force of curiosity as though he has crawled inside the human mind itself. He had come in late at night, barreled into the city in a cab holding tight to the leather stirrup as they swerved through traffic. His exhaustion was so great that even János’ exuberant talk didn’t revive him and he was allowed to go directly to the comfort of the closet. He removed the stiff and somewhat prickly cushions made from Turkish carpets from the back of the couch and stretched out with the soft blanket. He reached up and instinctively turned off the small intense lamp over the bed. With his other hand he reached the knob below the glowing numbers of the shortwave radio; it’s awkward antenna slanted to the ceiling. The FM station was playing Kodaly’s Variations on a Hungarian Folksong, and he listened for awhile as though struggling with a giant earpiece. Soon even this tired him. He turned the dial past rapid French, rolling Spanish, exclamations in Russian and Chinese and struggled to finally find a station with BBC news from distant corners of the world. For some time now he had turned first to words before sleeping. In the beginning it was listening to trustworthy-sounding British voices describing revolutions in places he’d yet to imagine. Then, hearing accounts of survivors gave him a kind of courage to face what outwardly seemed like calm, reasonable days in a rich, fairly ordered democracy. But his days carried with them the undertow of losing friends he loved most to illness or distance. The ensuing loneliness would sometimes sap his ordinary strength. It wasn’t just hearing about events around the globe and how noble individuals rose above their circumstance that gave him back a reservoir to draw from. Their voices offered a way into being in the world, invisible and nearly always in the dark; taking his imagination to the furthest reaches of hope. While searching through the scratchy tuner, Mayer passed jumping beats of the local hip hop stations, the stops and pauses of classical music followed by rapid sawing violins, then a gyrating saxophone with insistent originality. The blaring lyrics of popular music were the most painful and he fumbled in irritation as he rolled past. Why the need for words, he wondered, when any one of these local places on the dial should be able to hold his interest? It used to be his great pleasure to decipher who else could be listening at this hour, imagining people in cars, in hotel rooms, in the tiny dark apartments of towering buildings nearby who were possibly sharing the same sound. But Mayer needed to be far beyond the immediate city, to speed out over the dark waters of the Atlantic toward the lights of Europe slowly going out as the day dawned. To hover over Budapest long enough to spot his grandmother’s apartment. And from there to soar over the snow covered Alps, the dusted white steppes of Russia and arrive somehow, through some faint mention, at the mysterious terrain of outer Mongolia. There, in a small room in Ulaan Bataar, perhaps there was a young woman who had just returned from her day at work, lay on a small sofa and picked up a book. Leaning back to think, had she also turned on to music, then bypassed several channels in indecipherable languages, news reports of the capitol and then events in India-accented English, and found herself for a moment also tuned to the BBC? Was this what Mayer was seeking, a coded message across thousands of miles? He imagined her listening quietly to the same news, the frequent suicide bombings that still caused anguished sighs, the dramatic weather devastating new regions and, with relief, candid survivor’s reports. Then the authoritative crisp voice would somehow shift to UK business, the debt-ridden railway system, clogged healthcare, the doings of the royal family. At this, Mayer knew, the young woman might sigh again, and turn the dial in search of music, slightly astonished that a slow bass and now soothing saxophone were making their way to her across the universe of sound. At that moment, Mayer turned the dial again and found the greatest consolation: Thelonius Monk was playing slow, deliberate chord after chord. He finally drifted off to sleep in a distant inner room where Monk was somehow communing with Vladimir Horowitz, a peaceful place of shadowy radiant light. This essay by D. L. Pughe first appeared in Writings on Water, MIT Press. He is in Cloux near the castle of Amboise in the Loire Valley. He had retired to the royal manor house at 62 after exhausting nearly every possibility in Florence, Venice, Milan. Here he is allowed to think and dream, and occasionally help Francis I, the French king, with plans for a network of canals for the Loire. Fire flutters upward; water trickles down or drops from the sky. He is fascinated by liquid gravity, always descending, falling over, plunging, flowing downstream, pouring into the sea. Fire draws what is caught in it toward the sky like a passion that consumes you as it lifts you; water pulls you under in its powerful embrace. Was it this attraction as well as this fear that led Leonardo to contemplate it again and again, from every perspective? He realizes the ways water must be coaxed into channels and invited into canals by a beckoning drop in height. He imagines the deep hidden channels of water within the earth which, over centuries, have carved away hollow caves. He is torn by contradictory emotions of fear and desire: ‘fear of the threatening dark cavern, desire to see whether there are any marvelous things within.’7 Whirlpools sometimes stir there, awaiting each luckless thing pulled into their path. They can appear dark blue and calm, for instance, running among jagged cliffs behind an innocent Madonna cradling her child in a nest of rocks. Li moti son fatti dalli cor si de’fiumi; Li moti son disfatti dalli cor si de’fiumi. Was it this which drew Leonardo on? What leads him to draw a submarine, to take Aristotle’s notion of a ‘diving bell’ and want to plunge into the deep violet depths of the ocean? Knowing his accumulated fears of water, of the deluge that could sweep humankind away in a thunderclap and swirling curl of foam, what did he hope to find in the fluttering light on the ocean floor? But in the shadowy, spiraling realm below the surface of water there is no such relief. Plunged below an anchoring horizon, all points are indeterminable. It is a realm of impossible angles where light dances like snakes rising from the floor instead of crisp beams slanting down from the sun. Perhaps he was headed there all along, toward a more inexpressible abstraction. In his late writings Leonardo begins to re-define a point as an instant in time and a line as a length or duration.13 Gradually the lines of a winding river come to resemble his own time on earth, ending in the immensity of the sea. Duration there becomes blurred, hinting at eternity. On land, Leonardo devised a new means of atmospheric and aerial perspective to eloquently explore the blurring of the world. He noted the way objects diminish in sight as they recede from the eye, the way colors change in the distance (often merging into blue), and the haziness of edges, of vanishing: ‘the way that objects ought to be less carefully finished as they are farther away.’14 He applied these luminous rules to his painted landscapes, overriding hard-edged geometric schemes. And he delighted in the waters which trailed off into the bluish distance, in particular those at the edge of a certain portrait of a lady with whom he shared his room in Cloux. In the evenings did he linger in the deep turquoise water that travels through the craggy mountains behind her indecipherable smile? He began to call the Albertian method ‘simple,’ a construzione legittima but nonetheless artificial, then started to decode what he called ‘natural’ perspective. He resurrected the importance of our rounded world. The alleged ‘pyramid of vision’ which is said to frame nature and reach into our eye would give us a much different view than the one we actually see. He found our two eyes, working together, frame a graceful oval not a square. How did this play out under the surface of the ocean; how did this man, for whom the edges of light were once calculable angles, manage in the restless coils of aquatic shadows? Peering into water from above, he finds direct light does not allow him to look deeply into the layers of a stream, it bounces back his reflection and the sky. His eyes find a way in through other dark shadowy images reflected on the surface or what he calls the ‘skin.’ Observing submerged pebbles he sees how light bends as it enters the liquid world then diffuses in unpredictable ways. It would be several hundred years before a ‘wave’ theory of light came to be accepted, but he was already suspicious of the sanctity of beams. Straight things seem to dissolve into ribbons in watery realms. Descartes would later describe how a stick in water appears bent from refraction, and that only a child would most likely believe it is truly bent. ‘Touching it, however, confirms that it is straight and goes beyond our preconceived opinions.’16 Descartes believed all ‘visual errors’ could be corrected this way—our senses working furiously in tandem to check and balance one another. He calls this ability ‘reason;’ Leonardo called it common sense, senso comune, where the five senses minister to the soul and enhance artistic perception. He was the master of depicting shadows, smoky contours: Sfumato was his special means of rounding edges by subtle gradations to capture three-dimensional views. He explains how the density of a shadow is darkest closest to that which casts it, then fades away as it stretches into the distance. But looking down on water, shadows from above leap great distances and nearly disengage from their source. Bridges, for instance, leave their wobbly geometry on the surface some meters up or downstream. And immersed underneath the sea, the shadow of a fish swimming above can dart across the ocean floor a safe distance away just as its fin touches your shoulder. How did he try to capture these shifts of location, the curves of light, the diabolical dimensions of vision in the hushed immense chamber of the ocean? We cannot know. In his rooms at Cloux in those final days he dreamed again of the deluge, his sketches becoming more and more cataclysmic and yet full of a vibrant conclusion: visual clashes of cymbals and drums and trumpets. He finds a sketch of a storm of our human failings, our foolish desire for objects suddenly bursting and falling from a dark thicket of clouds. Comforting him in his last hours, the outstretched arms of St. Anne, the enigmatic face of La Gioconda, and the even more mysterious smile of St. John, his flame-like finger pointing toward the sky. They all appear to know something. And joining him in thought: a self-portrait, his beard cascading in silent waterfalls. He had once believed that swimming is the closest we can come to understanding what birds do in the air. It can free us from gravity and fear. Like flying, it is a pushing away, and he believed we could push, that water could be mastered. Challenging Christ, he devised shoes with helpful poles for walking on the surface. And attempting to defy the gods, he designed a life saver not unlike those carried on giant ships traversing the seas. He had once designed an underwater suit to dive the depths of the ocean. Did it occur to him now that the ocean floor might be the safest place to hide? He had altered his judgment of the world and had begun to embrace the curved reality we, too, have recently begun to know. What did the deepest depths of blue water hold in final reckoning? 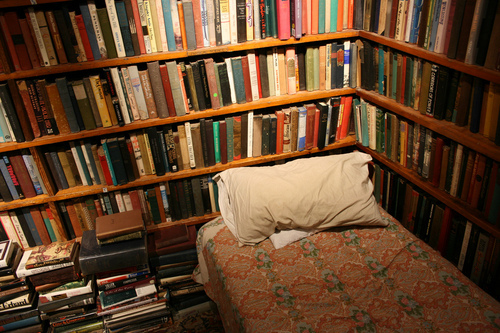 A resting place, a refuge, a realm of constant revision and invention. 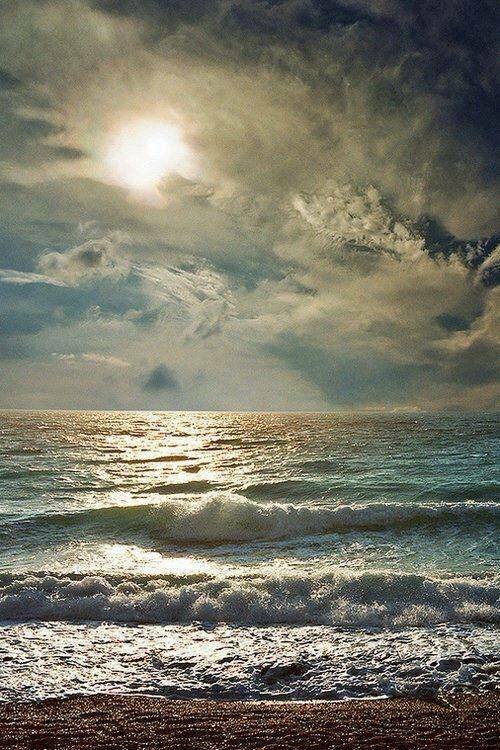 A point of vanishing where the soul is firmly anchored in scattered turquoise light. This essay originally appeared in Writing On Water (Terra Nova Books), edited by David Rothenberg and Marta Ulvaeus, (MIT Press, 2002). 1 Leonardo da Vinci, The Notebooks of Leonardo da Vinci, Vol. II compiled and edited from Leonardo da Vinci, The Notebooks of Leonardo da Vinci, Vol. II compiled and edited from the manuscripts of Jean Paul Richter (New York: Dover, 1970) Section 922 175. 2 The notebook of underwater perspective was not mislaid, it was simply but sadly never written. 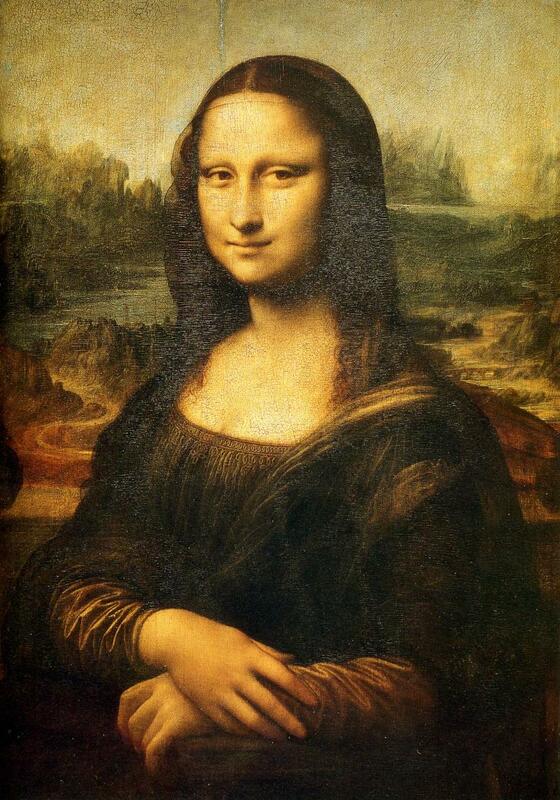 It is not known if Leonardo did intend to write one. 3 Leonardo da Vinci, The Notebooks of Leonardo da Vinci (Oxford: Oxford University Press, 1952) 218. 4 Leonardo, The Notebooks, Vol. II, Section 933 181. 5 Leonardo, The Notebooks, Vol. II, Section 971 201. 6 Leonardo, The Notebooks, Vol. I compiled and edited from the manuscripts of Jean Paul Richter (New York: Dover, 1970) Section 606-611 305-314. 7 Leonardo, The Notebooks, Vol. II, Section 1339 395. 8 Leonardo, The Notebooks, Vol. II, Section 945 187. 9 Leonardo, The Notebooks, Vol. II, Section 965 197. 10 Leonardo, The Notebooks , Vol. II, Section 919 175. 11 Leonardo, The Notebooks, Vol. II, Section 979 205. 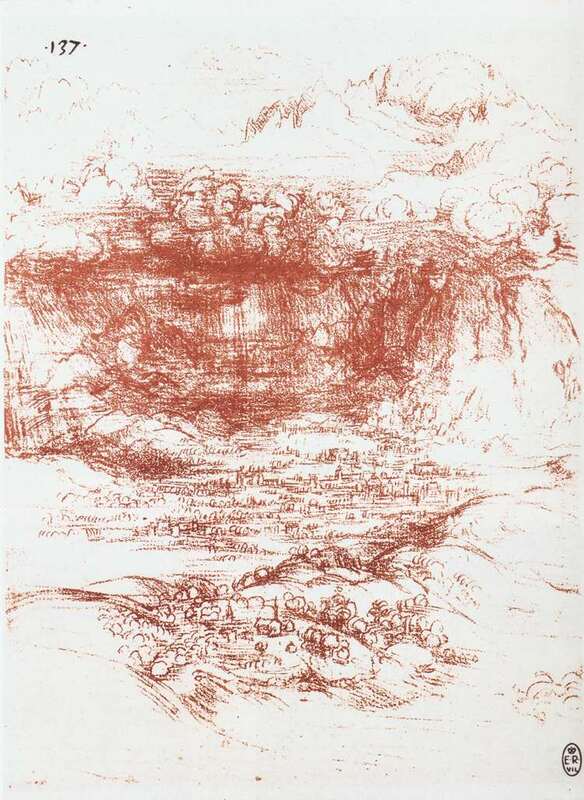 12 Leonardo da Vinci, Trattato della Pittura di Leonardo da Vinci, Section 121, quoted in Kenneth Clark, Leonardo da Vinci (Cambridge: Cambridge University Press, 1939) 76. 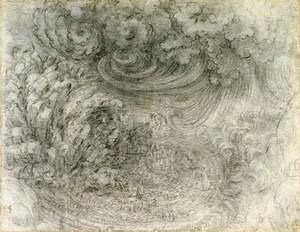 13 Leonardo da Vinci, Codex Arundel, Section 190 in The Literary Works of Leonardo da Vinci, ed. J. P. Richter (London: Oxford 1939, rev. ed. New York 1970) Paragraph 916. 14 Leonardo da Vinci, The Notebooks of Leonardo da Vinci, ed. Edward MacCurdy (New York: Reynal, 1939) 864. 15 Leonardo da Vinci Notebook A (Paris: Bibliothèque Nationale 2038) 9v, R paragraph 69. Quoted in James S. Ackerman’s Distance Points, Essays in Theory and Renaissance Art and Architecture (Cambridge: MIT Press, 1991) 116. 16 René Descartes, Descartes, Selected Philosophical Writings, trans. John Cottingham, Robert Stoothoff, Dugald Murdoch (Cambridge: Cambridge University Press, 1988) Section 439 124. 17 Leonardo on Painting, ed. Martin Kemp (New Haven: Yale University Press, 1989) 234-235.